Oil on canvas mounted on masonite. Karl Hubbuch, who was originally from Karlsruhe, often travelled to Berlin. It was there that he met George Grosz and Rudolf Schlichter, with whom he joined the radical Novembergruppe and Rote Gruppe, and later the Neue Sachlichkeit. Despite his radical ideological stance, the critical accent of his painting was tempered by the more moderate and classical style characteristic of the Karlsruhe artists. Twice Hilde II is a double image of Hubbuch’s wife, whom he painted on numerous occasions. Hilde Isai (1905–1971), one of his drawing from life students at the Karlsruhe academy, whom he married in 1928, was an energetic and independent woman who eventually left her husband to devote herself to her passion for photography at the Dessau Bauhaus. The composition, in the manner of a Doppelgänger, was initially designed as a quadruple portrait which the artist later cut into two after the central part was damaged by a leak. The two pieces, which were exhibited together on a few occasions, and the preparatory drawings provide a progressive sequence of Hilde’s personality. Hubbuch, who was very fond of multiple portraits, instead of attempting to capture Hilde’s personality in a single figure, breaks it down into numerous facets, from the image on the left — which shows her seated with crossed legs on a modern tube chair designed by Marcel Breuer in a serious, prim pose wearing glasses that give her an intellectual air — to the provocative, coquettish woman in her underclothes on the far right of the Munich double portrait. Like most of the members of the German New Objectivity movement, Hubbuch was attracted by everyday scenes and by rendering various objects and textures in minute detail. 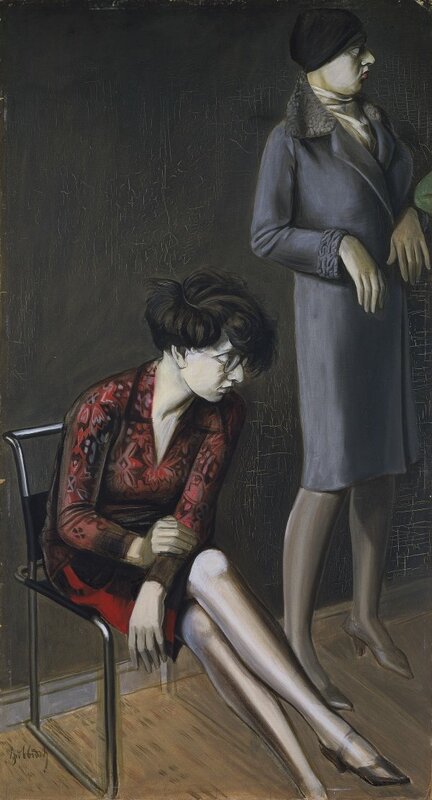 Although the painting has often been dated to 1923, in the catalogue of the retrospective exhibition of the painter’s work in 1981, the first serious critical study of his oeuvre, Wolfgang Hartmann ascribed it to 1929 on the grounds of particular stylistic features and the fact that Hubbuch did not meet Hilde until 1926.